As wire fox terriers, may we relate that we, as a breed, are indebted (you'll note the irony of the word) to Thomas Jefferson (TJ and his debt, another story), for The Louisiana Purchase. He certainly brought home the idea of extending the national backyard. the area close to where one lives, or the territory close to a particular country, regarded with proprietorial concern: anything was preferable to a nuclear dump in their own backyard. Nuclear dumps and Thomas Jefferson? That's too much of a Kevin Bacon stretch, even for us. We will define backyard on our own terms, in our own terms, and we begin, being Doodlecentric, in our own backyard. Gimlet killed a rat yesterday in the backyard. Mr. Rat was very old, very seasoned (not seasoned, Mal Carne) and should have known better than to mount a birdseed expedition in mid-afternoon. Short and sweet: Gimlet saw Mr. Rat and shall we say, he wound up buying The Louisiana Purchase. Gimlet and the late Mr. Rat. Photo by Joe the Cat (who watched as Gimlet outcatted him). Gimlet saw Mr. Rat atop a birdfeeder, rushed outside and made a mad dash around the backyard. Mr. Rat, seasoned veteran that he was, knew the backyard, with all its plants and trees, offered a ratamillion places to hide. And hide he did, for a time. But Gimlet, being a wire fox terrier, did not give up, and pursued him, as Khan and Kirk, single mindedly, with no intention of giving up. That's tenacity, and that word is owned by ratting terriers such as Gimlet and the legendary Dirty Bart. That is a word and a story for another day. Gimlet made the sounds of the backyard, never taking her eye off the prize. Eventually, Mr. Rat reappeared, and Gimlet took after him. He ran up a cherry laurel tree. At its bottom was Gimlet. She began to jump. The jumping alerted her assistant, who grabbed a hose and cooled Mr. Rat's jets. Down the cherry laurel ran Mr. Rat, and there Gimlet dispatched him. Teamwork. But Mr. Rat was tough, and it took a few extra blows to the midsection before he was transported off to Rat Heaven or the McDonalds of his choice. They say Mr. Rat was in the vicinity of 18 inches, in full rigor, and without his vigor. That's what they say, although no yardstick was brought forth. 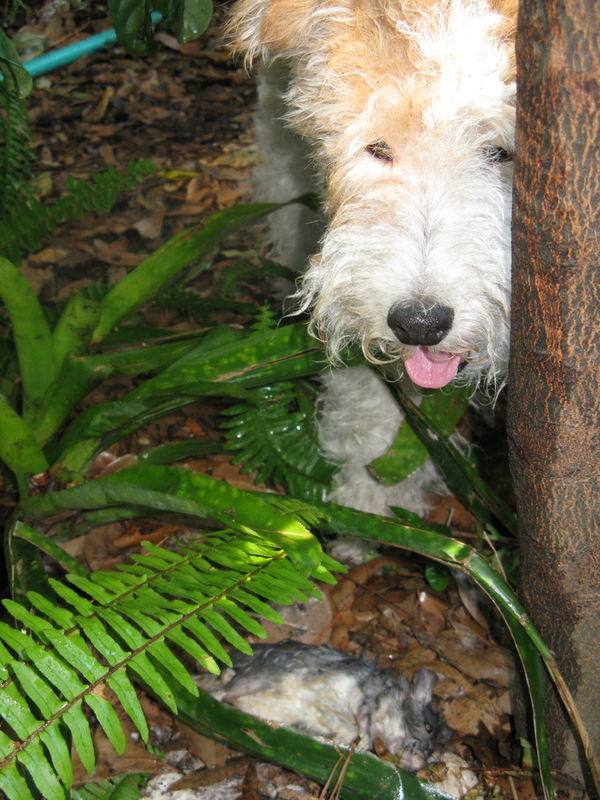 He was a very large rat, and wily, but on this particular day, in this backyard, with this wire fox terrier, he had met his match. Gimlet and Mr. Rat's scuffle lacked the excitement of Jefferson and John Adams and their epic and contentious struggle in the Election of 1800. Gimlet does have her Jeffersonian ideals, though, and would not mind extending her backyard a la Mr. Jefferson's Louisiana Purchase. And like Mr. Adams, Gimlet does appreciate authority, especially when it is her own. Own up, Stephen Colbert. You are one of our favorites, but your "Word" segments? 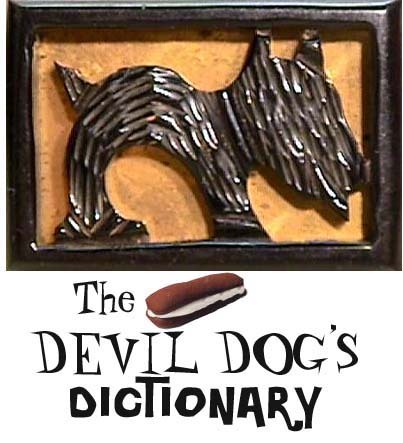 Clearly, they owe more than a nod and a wink and an adjustment of glasses to our Devil Dog's Dictionary. Being devils ourselves, we appreciate the flattery, and we won't tell anyone if you confess. Which of course, we know you won't. Just as we won't own up to more than a little influence from Ambrose Bierce, and his Devil's Dictionary. Nothing like being among like-minded friends, sipping cocktails and eating devil dogs or TastyKakes, in your own backyard.